Felicia M. Haigh, raised in Cary, North Carolina, graduated from North Carolina State University in Raleigh, N.C. before receiving her Juris Doctor from the University of North Carolina School of Law in Chapel Hill, N.C. In law school, she served as an executive board member of the Women in Law group. She also was an Articles Editor for the North Carolina Journal of International Law. After graduation, Felicia spent a year as a clerk to the Full Commission with the North Carolina Industrial Commission. 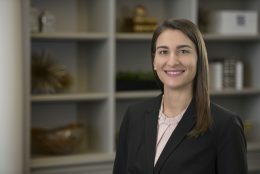 As an attorney at Anderson Jones, PLLC, she focuses on workers’ compensation defense and general civil litigation.